Plymouth - Travel by train - Plymouth station, North Road, Plymouth, Devon, PL4 6AB. Tel: 08457 000 125. Ticket office. Waiting rooms available at all platforms. Cafe and food outlets. Pay phones are available at the station. Shops. Step free access whole station. Station wheelchair is available. Taxi rank. Just over 1 mile Plymouth rail station to the ferries. 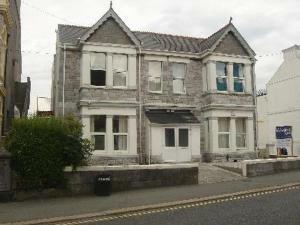 (Plymouth Ferry accommodation). 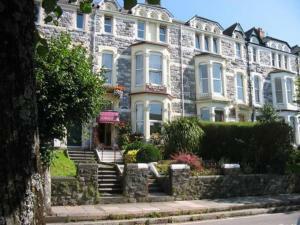 It is about 4 miles from Plymouth rail station to the Plymouth airport. (Plymouth Airport accommodation). Plymouth St Budeaux Station, Wolseley Road, St Budeaux, Plymouth, PL5 1JJ. Customer service 08457000125. CCTV. Pay phone. Only parts of station step free access. Also see Plymouth tourist and travel information. Welcome Rest is a 5-minute walk from Plymouth city centre, close to the train station, university, North Hill and Mutley Plain. The hostel has 17 private rooms, 9 of which are en suite. All rooms have Wi-Fi. There are shared cooking and dining facilities, and a lounge with Sky TV and sports channels. This cosy, non-smoking family run hotel offers practical, homely rooms and an informal atmosphere in a convenient location. A short walk from Plymouth University and railway station, and a 15-minute stroll from the famous How and Barbican areas, this is a comfortable setting to which you can return after a busy day's exploring. Bring your laptop and you can plug into free internet connection in your room, or unwind in the elegant Victorian lounge. Plymouth rail accommodation. Plymouth Station 1.0 miles. Plymouth St Budeaux Station 3.7 miles. Location: In the centre of Plymouth. There is always a warm & friendly welcome at this family run hotel which is decorated to a high standard, situated close to the City Centre of Plymouth and the historic Hoe and Barbican. Family and ensuite rooms available. Ample parking. Plymouth rail accommodation. We have 4 top luxury self-catering holiday apartments to offer you in the heart of the historic Barbican & Hoe areas of Plymouth, Devon. These 5 star luxury self-catering family holiday apartments in the city of Plymouth make a perfect base for any holiday at any time of year.